Issues of transport infrastructure have never been far from the headlines nationally in recent months, with the government’s commitment to the controversial HS2 high speed rail project getting a large share of column inches. Airport capacity has also been flagged up, with the spectre of the Third Runway at Heathrow raising it’s head again – A political hot potato, the government have set the Davies report in to this issue for after the next general election. In Hillingdon, we are affected by both, with HS2 looking to carve a swathe of devastation through the north of the borough and a possible third runway decimating the south. Our local UKIP branch have been campaigning on both issues, but also on the state of our roads – Indeed, a resident’s petition in Cowley co-ordinated by the branch has seen the three roads affected re-surfaced recently after years of failed patching of potholes. We have also been alerted to heavy goods vehicles speeding in both Harmondsworth and West Drayton, with our teams out talking with local residents about how they would like the issues tackled. Upcoming EU regulations increasing the size of lorries allowed on English roads could also make a bad problem far worse. In response to the many enquiries we have received about transport issues, UKIP Hillingdon have now organised a public meeting entitled ‘Trains, Planes and Automobiles’ for next Saturday (14th September) at 7pm. John is a respected campaigner on noise and pollution issues surrounding airport expansion who has spoken and campaigned across Europe. HACAN Clearskies, along with campaign group NOTRAG and assisted by local MP John McDonnell, fought and successfully stopped a third runway being built at Heathrow last time it was suggested. 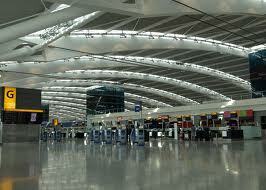 John will be giving the case against Heathrow expansion. 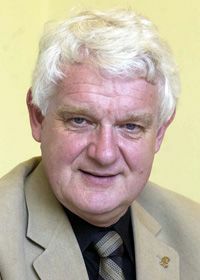 Two term Member of the European Parliament (MEP) for the West Midlands, Mike is not only the UKIP spokesman but sits on the EU committee for transport and tourism. Admission is free, and there will be a Q&A session after the speeches. If you have an interest in transport on a local, national and indeed international scale, then we look forward to seeing you there. 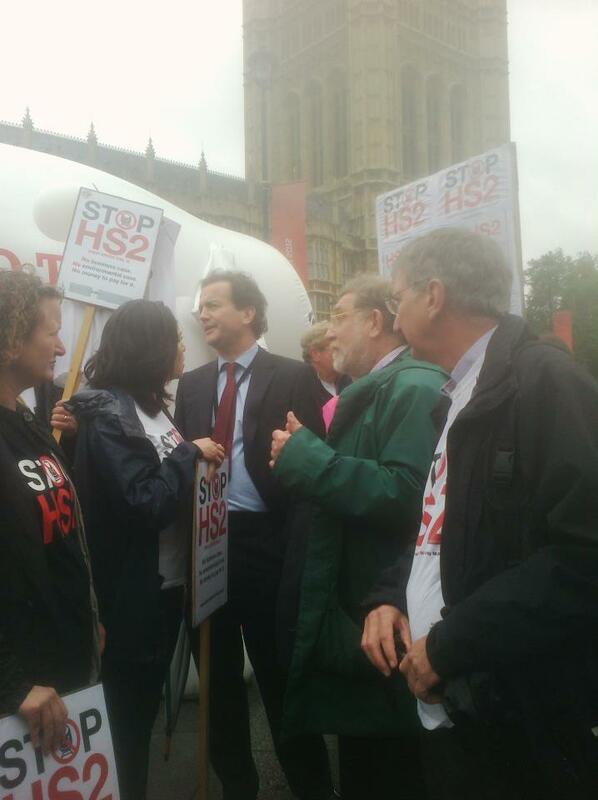 Last Monday (16th July), the Stop HS2 campaign group took their message to the House of Commons. 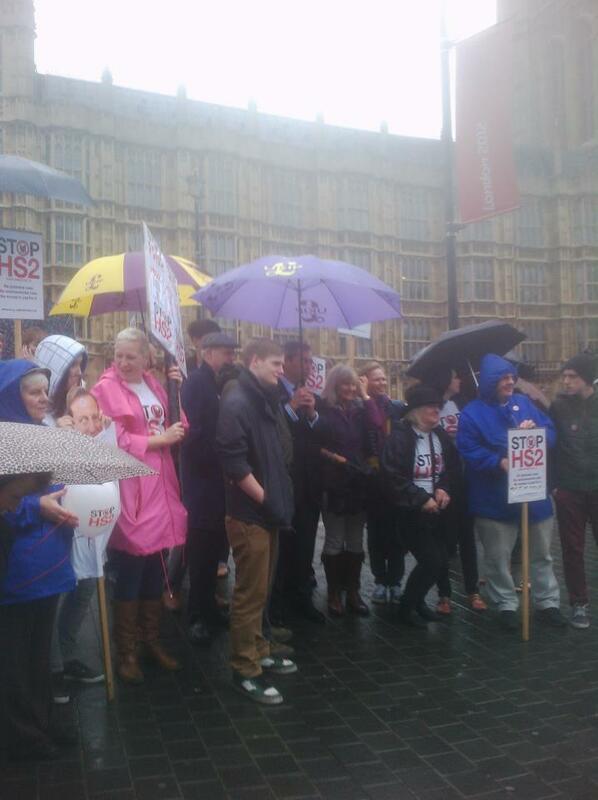 Consisting of ordinary people from along the length of the proposed high speed rail line, they have been massively successful in gaining publicity about the lack of a sound case for building this new rail link and have confronted both the HS2 Ltd company that has been put together to organise the construction and the successive governments that have insisted that it must be built. 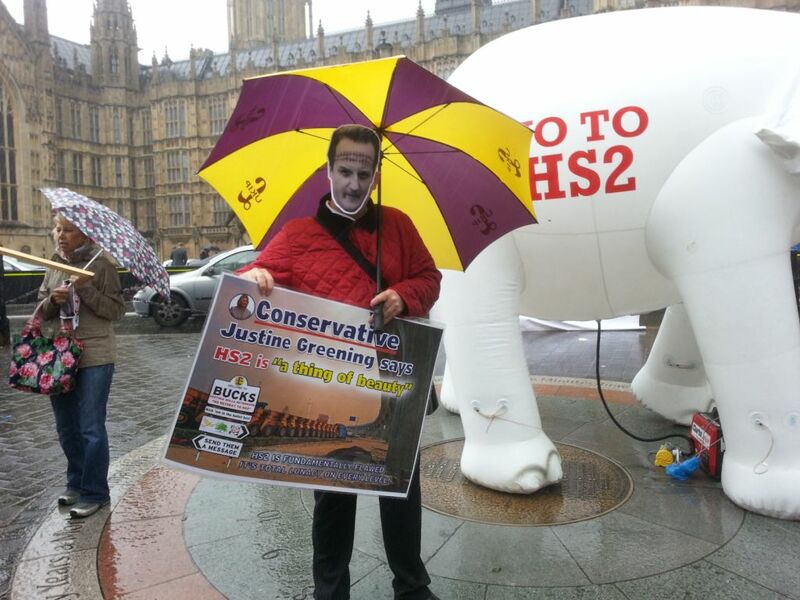 Whilst they are an independent and non-aligned protest organisation, both myself and UKIP as a party (Both nationally and locally) oppose HS2 and as such I tagged along to show my support for the demonstration on the day. 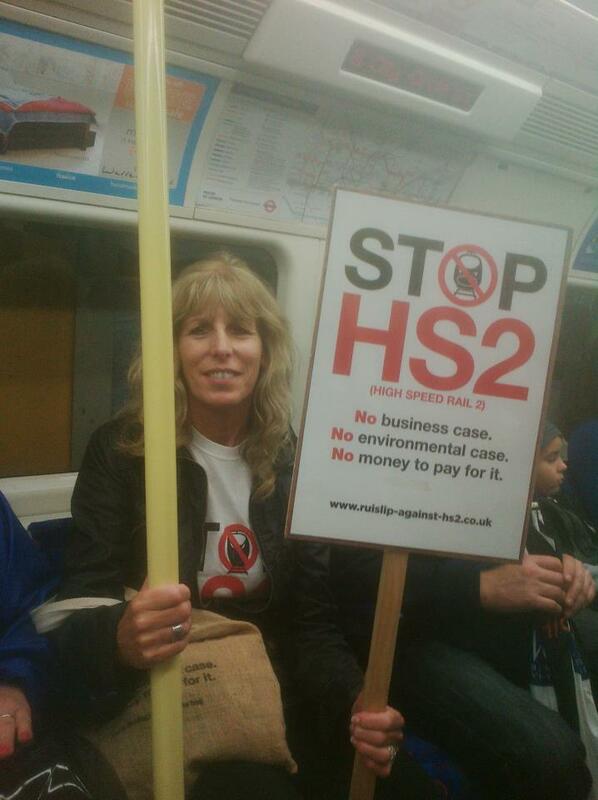 I met with the Hillingdon protesters at Ruislip Underground station at 10am, from where we travelled by Tube to Westminster to meet up with groups from other areas.I was advised by the demo organiser, Lottie Jones, that the MP’s split for their summer holidays the following day so the protest was organised to keep the issue of HS2 fresh in their minds as they headed off. Whilst on the Tube, it also became apparent that the Government had announced that morning a £9 billion pound rail network investment programme aimed at upgrading existing lines – Something that the campaigners had been calling for as an alternative to HS2. Indeed, one of the people present commented that the architect of the HS2 project had been on record as stating that electrification of the Midland Main Line should be resisted as it would seriously undermine the case for building HS2! We arrived at the muster point under the statue of King George V at around 11.30am, where protesters from other areas were starting to assemble and put up their banners. 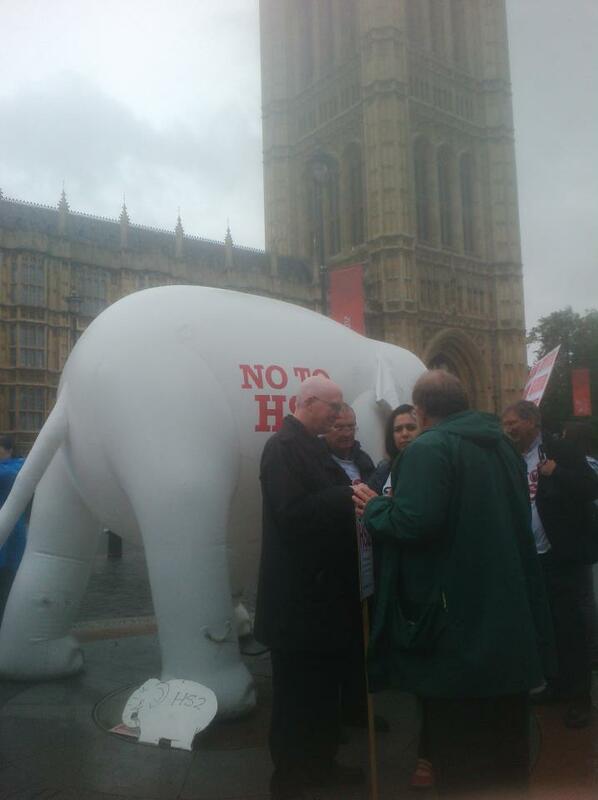 A huge inflatable white elephant was to be the centrepiece of the demonstration, and attracted attention from a number of journalists in the area who came over to talk with the organisers. Just before 12pm, we also got a boost with the arrival of UKIP leader Nigel Farage to have a chat with those assembled and to show support. Amongst the other familiar faces to arrive with him were UKIP press officer Gawain Towler, GLA mayoral candidate Lawrence Webb and Aylesbury councillor Chris Adams. Film crews were also starting to take an interest, with Russia Today the first of a number to show up. These were followed by a team from the BBC and finally a very well dressed and affable fellow from Sky with his team. 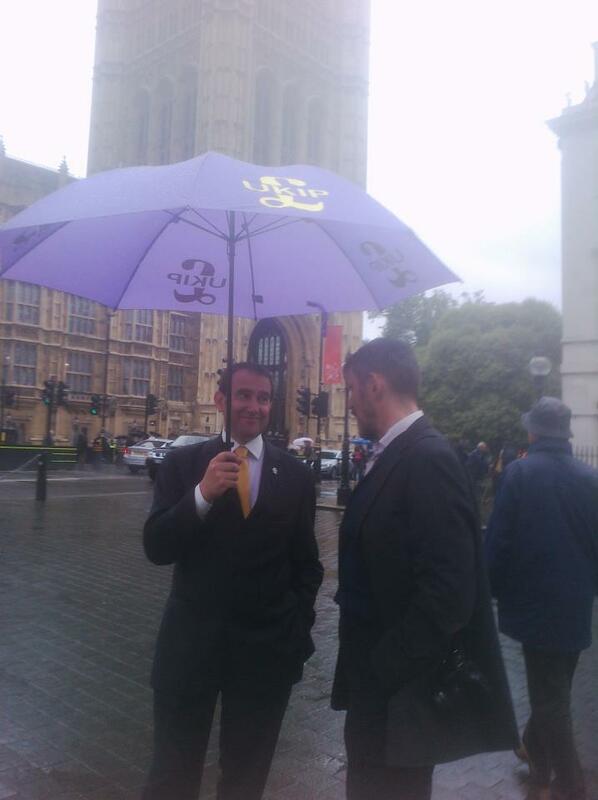 Most of the UKIP luminaries moved on after around fifteen minutes, although Chris Adams stayed with us to the end. He is currently producing leaflets for his Aylesbury constituency pointing out the absurdity of spending £32 billion of public money on a train line that most ordinary people won’t use or can’t afford and how everyone in the country will be affected by this in increased taxes to pay for it! He brought a large laminated copy of the leaflet with him for the day,and can be seen displaying it (right) with one of the David Cameron masks that were doing the rounds obscuring his handsome features! 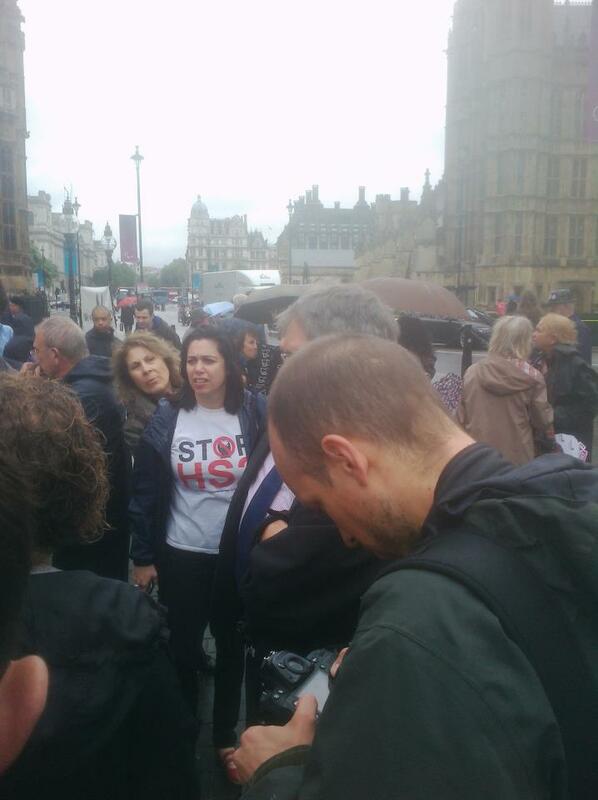 Just before 1pm, a spokesman for the Stop HS2 campaign made a speech from the bottom of the George V statue commenting on the £9 billion upgrade package, and advising all who were there of what the campaign had achieved so far and what more needed to be done in the coming months. He then asked all present to dial in to the House of Commons switchboard and ask for their MP to come out and speak with them. I rang through and asked to speak with Hayes & Harlington MP John McDonnell – The switchboard put me through to his office, where I received a recorded announcement telling me that this is a message line for him and messages can only be left between 10am and 1pm Monday-Friday! The other campaigners had more success with their MP’s, and we were soon joined by Uxbridge MP John Randall and Ruislip & Northwood MP Nick Hurd. 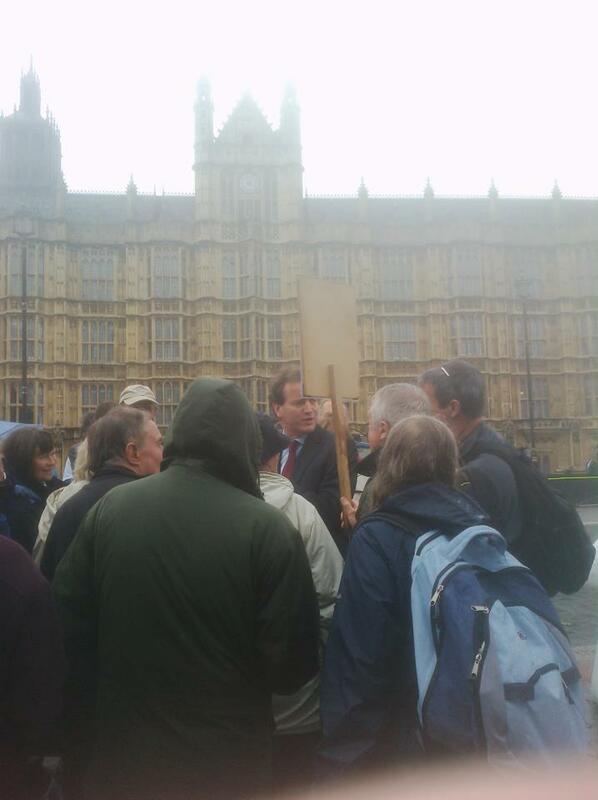 John Randall (In the green jacket) chatted quite happily with the crowd for around twenty minutes and seemed to be genuinely interested in the issues, whilst Nick Hurd (In the red tie) also promised to look in to certain aspects that the demonstrators were raising with him. Another MP who I didn’t recognise also came down and talked with the assembled protesters for around ten minutes before heading back in to the House somewhat dampened from the experience! I spoke with a number of people throughout the day who had travelled in to London to have their voice heard by our government. 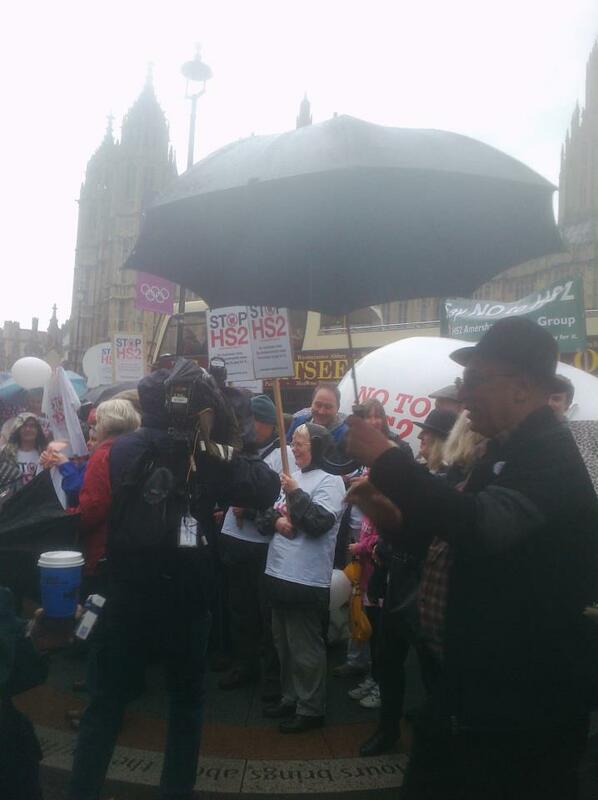 The message from them all was quite clear – There is no valid business case for HS2, it is a massive waste of money when other options are available at a fraction of the cost to improve our railways, it will destroy large swathes of the countryside and the country in it’s current predicament can’t afford it. 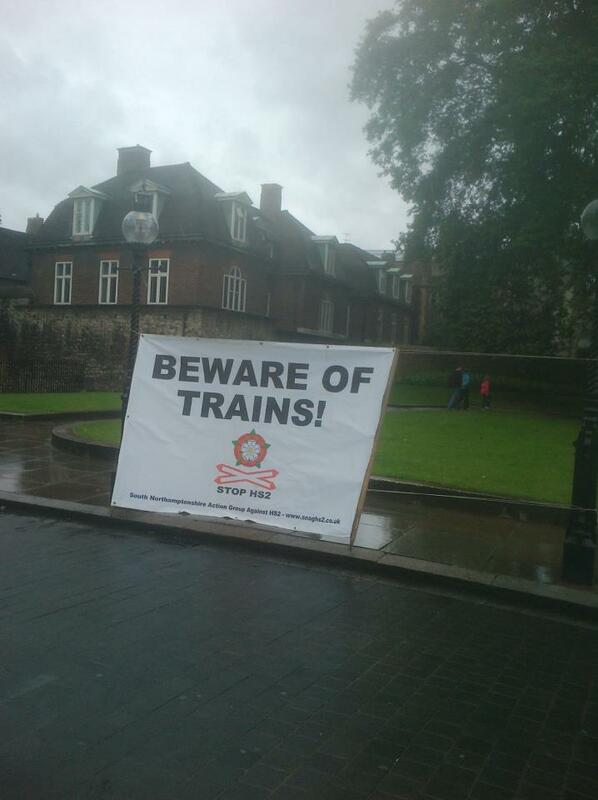 This message was conveyed calmly and firmly to the MP’s who spoke with us on the day, and hopefully has been noticed by transport minister Justine Greening. She has delayed discussion on the compensation packages for those affected until Parliament returns in the Autumn, when stage 2 of the project (Including the Heathrow Spur) will be announced. Let us hope that the protesters voices are heard and that there is no need for compensation or a stage 2 as reason will out and the whole waste of money will be shelved.